PARK is about a landscape unlike any I've encountered before. Fresh Kills landfill: massive in scale, part natural, part made, in an experiential state of 'becoming' as it is reclaimed from trauma; it is a loaded microcosm of our past, present, and future environments. PARK, a multi-cycled performance-based work, is about a landscape unlike any I've encountered before. Fresh Kills landfill: massive in scale, part natural, part made, in an experiential state of 'becoming' as it is reclaimed from trauma; it is a loaded microcosm of our past, present, and future environments. Once the largest landfill in the world, Fresh Kills is ten years into its 30-year transformation into a park. In both 2010 and 2011, I received rarely awarded artistic residencies at Fresh Kills during which scores were created that respond to and evoke the experience of the site in its current liminal state -- no longer landfill and not yet parkland. 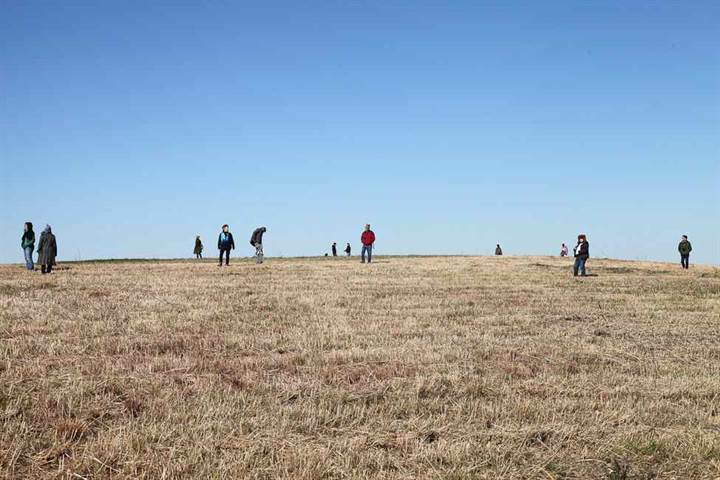 For one score, 30 people wandered across a grassy yet barren, reclaimed landfill mound. While a seemingly everyday act it nonetheless had never before happened at Fresh Kills. PARK scores continue to be re-imagined and remade beyond the iconic landfill site, including, thus far, at the RAW: Geographies Art Festival in Portland, OR; a former bank vault in the New York City financial district; and the New York Live Arts (formerly Dance Theater Workshop) Studio Series . PARK collaborators are poet Jennifer Scappettone and architect Seung Jae Lee. Additional collaborators include musician Tamio Shiraishi and a cast of performers.